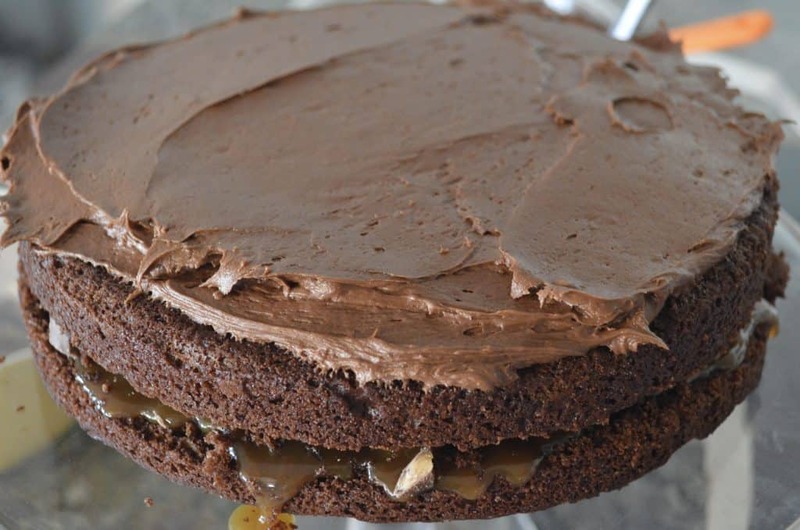 Don’t miss this incredibly delicious recipe for Chocolate Cake with Toffee and Caramel sauce drizzle! 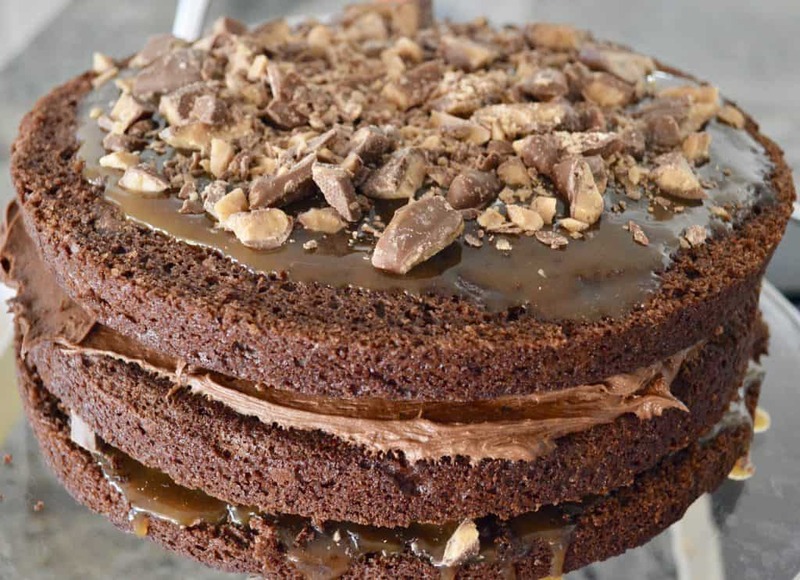 Chocolate Toffee Caramel Cake will be your new favorite recipe for chocolate cake. 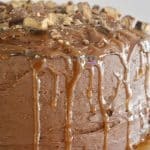 If you’re looking for the perfect chocolate cake recipe for your next party, this Chocolate Toffee Caramel Cake is it! 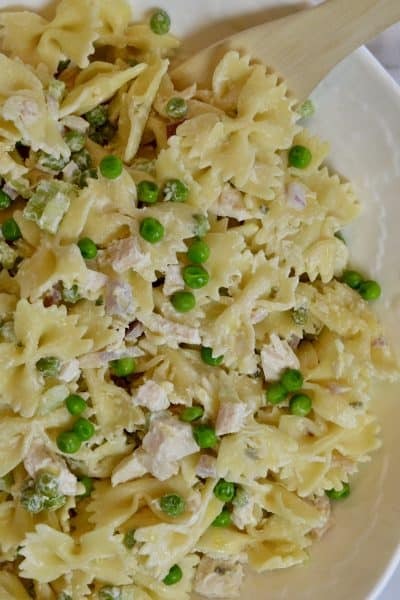 Easy to make and tastes so much better than store bought. 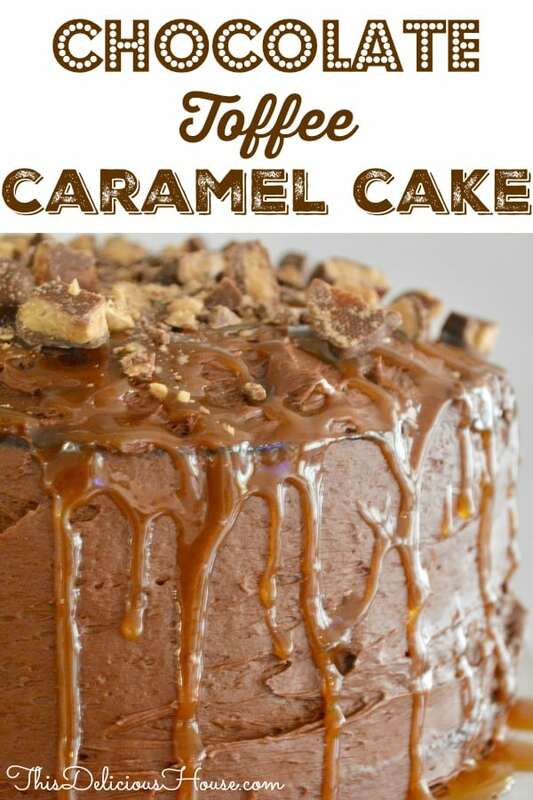 The entire cake can be frosted and refrigerated a day in advance, adding the caramel drizzle and Heath Bar a couple of hours before serving. First, you need to prepare the cake batter. You can bake the cake layers up to a week in advance and just freeze them in airtight ziplock bags. I actually prefer to do this because it’s easier to cut and frost chilled cakes. 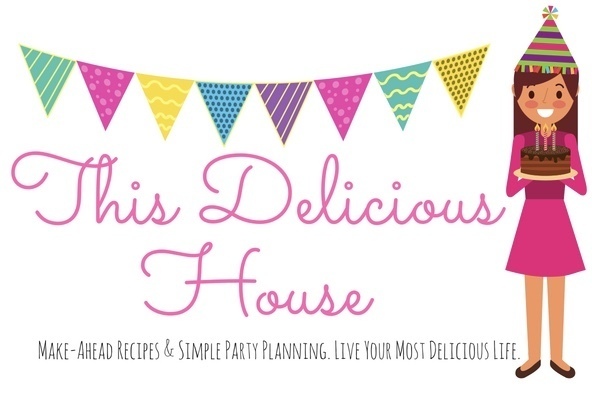 To make the cake, preheat oven to 350 degrees and grease two 9-inch cake pans lined with parchment paper. 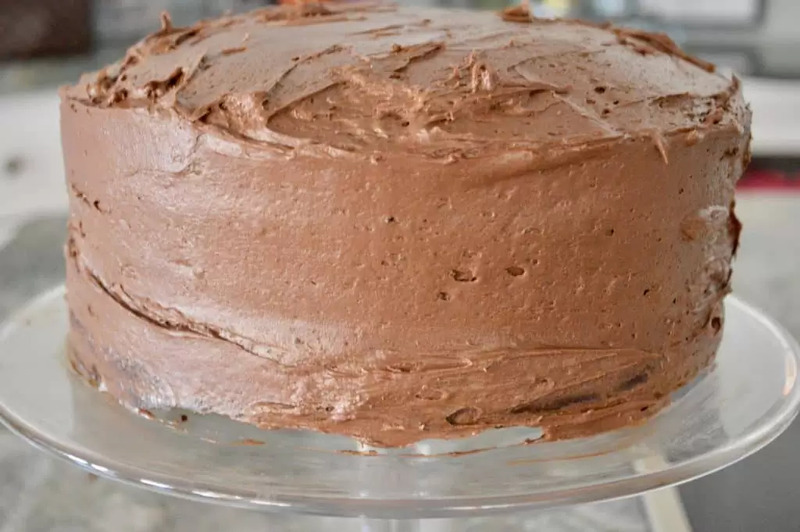 Whisk together the cocoa powder with boiling water to help yield that delicious deep chocolate flavor for the cake. Combine the wet ingredients together with a hand mixer, folding in the dry ingredients to combine. Mix in the cooled cocoa/water mixture. Mixture will be slightly runny. Pour the batter into the prepared pans and sprinkle in chocolate chips. Bake for 40-45 minutes, or until toothpick inserted in middle of cakes comes out clean. Cool on wire rack for 10 minutes before removing from pan. If freezing, allow to cool completely before placing in ziplock bags. When the cakes are cooled, use a serrated knife to cut in half diagonally so you have four layers of cake. It is easier to cut if you chill the cakes slightly beforehand. Add in the powdered sugar and cocoa powder. Mix on low for a minute until combined. Add in the vanilla and mix for another minute. Set aside. 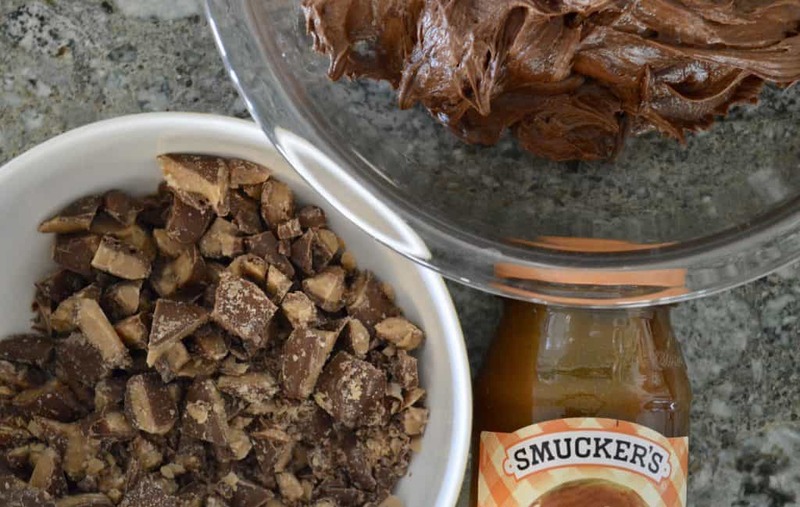 Roughly chop up the Heath Bar and warm up the caramel sauce (lid off) until it is pourable. Set aside toppings for cake assembly. 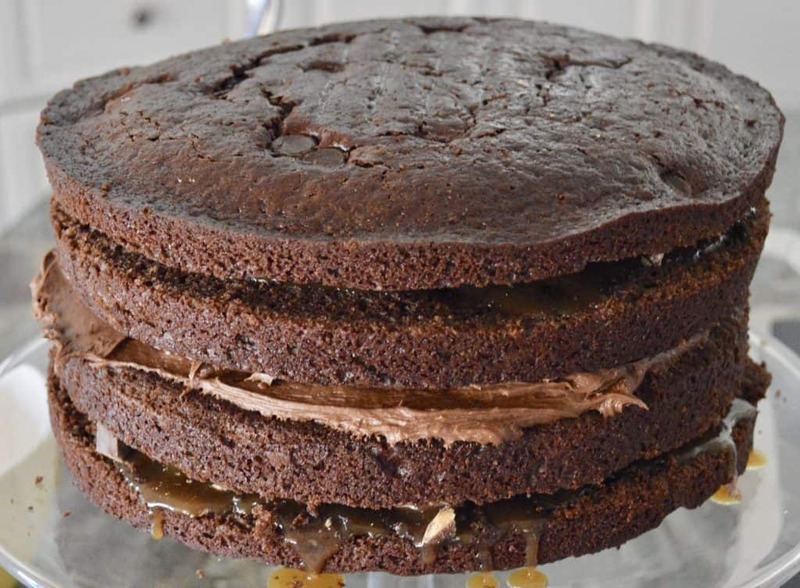 To assemble, place one of the top layers of the cake face down on the cake stand and press gently to flatten. Add 1/3rd of the container of caramel sauce and spread over the cake layer leaving a 1/2 inch border. Add 1/3rd of the chopped Heath Bar. 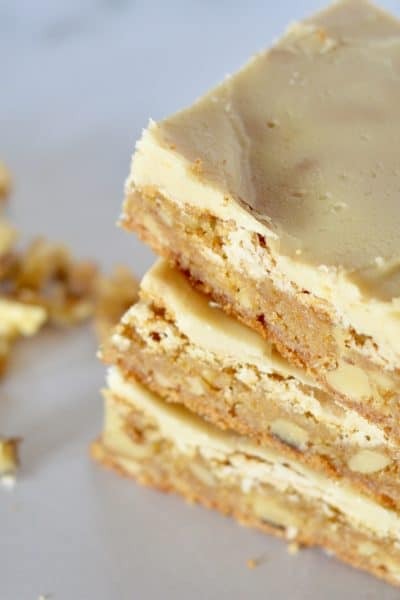 Place a bottom layer of the cake on top of the Heath Bar and top with frosting. Add on another bottom layer of the cake and top with 1/3rd of the caramel and 1/3rd of the chopped Heath Bar. Finish with the top layer of the cake and frost the entire cake. 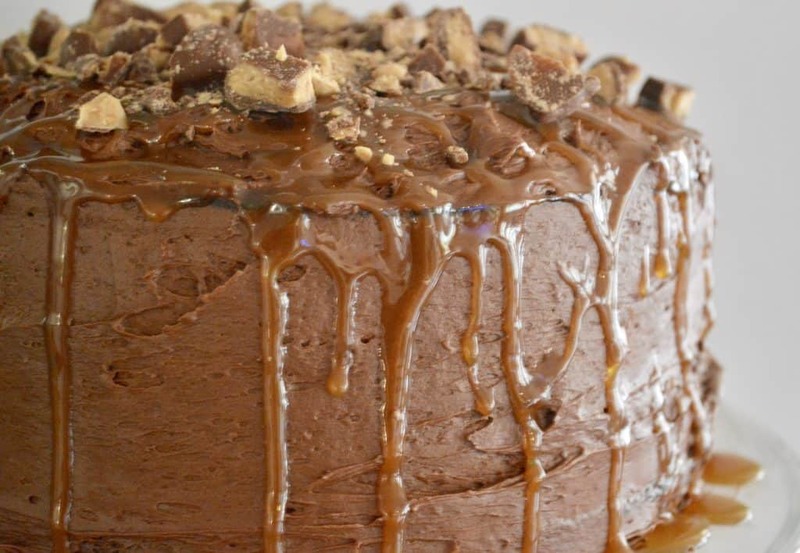 At this point, you could refrigerate the entire cake or, if serving soon, drizzle on the remaining caramel sauce and top with the remaining Heath Bar. Always use room temperature ingredients when baking. Doing so will yield a more consistent texture and fluffier cake. Forgot to take your eggs out of the fridge? Soak them in warm water for 5 minutes to bring them to room temperature. 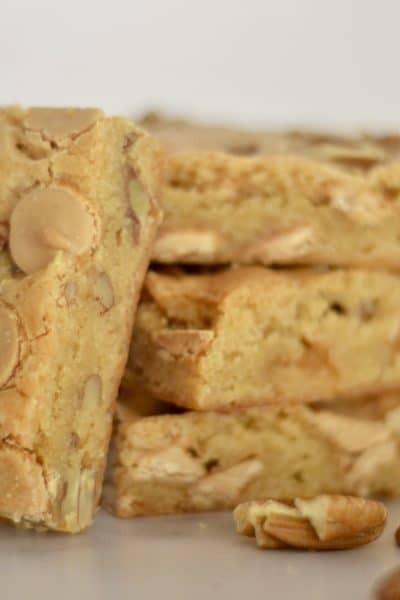 This cake is a great cake to start baking with! 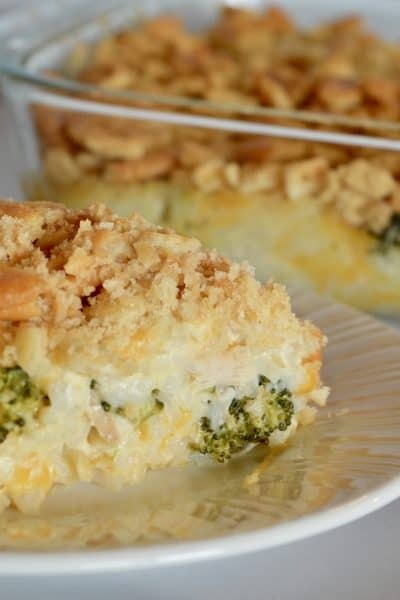 It is virtually fool proof and looks better in a more rustic state. Don’t worry about the cake layers being completely flat or the frosting going on perfectly. In my opinion, it looks better with texture and the caramel sauce and Heath Bar cover up any inconsistencies. Not a fan of Heath Bar? Use whatever bar you like! This cake would be delicious with Butterfinger, M&M’s, or Whoppers. Make-ahead chocolate cake: simply make the cake layers and cool them completely. Then wrap in plastic and place in an airtight ziplock bag. Freeze for up to a month or until ready to use. The cake is actually much easier to frost and put together when the layers are well chilled. 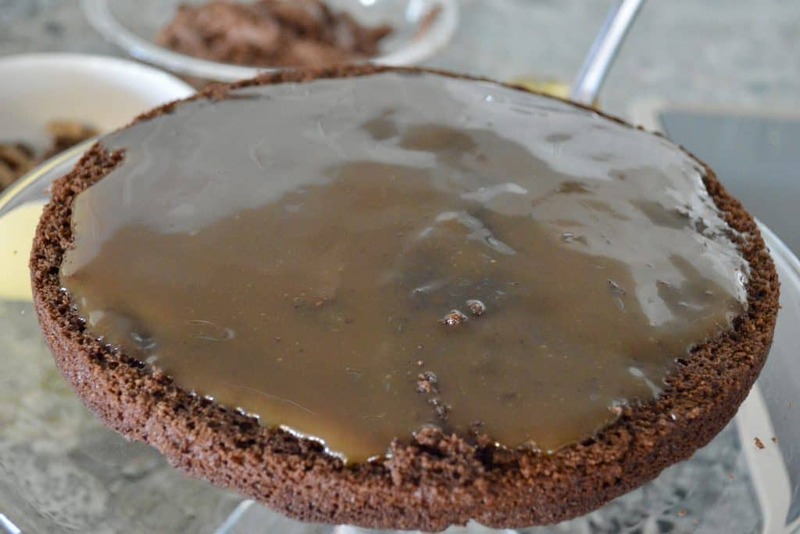 Drizzle on the caramel sauce topping when the cake is placed on it’s serving platter. 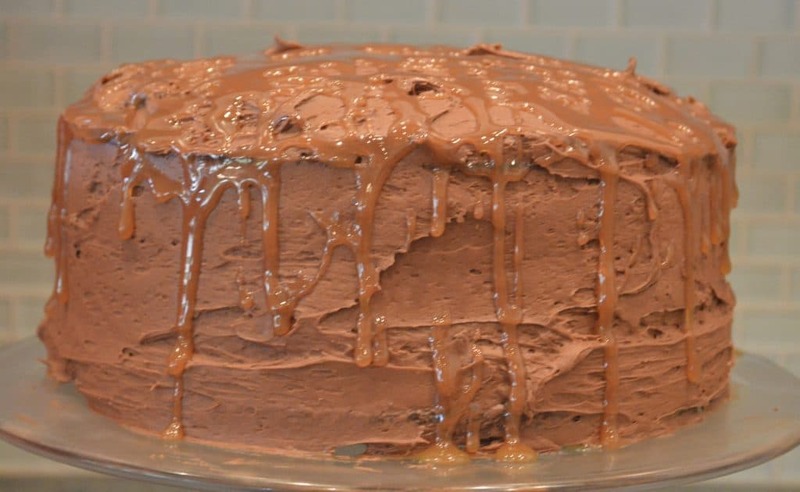 Chocolate Toffee Caramel Cake looks so pretty when you can see the puddles of caramel sauce on the cake stand. Hands down the most glorious and delicious chocolate cake you’ve ever had. Just look at the inside of this beauty. So moist with crunchy bits of toffee! 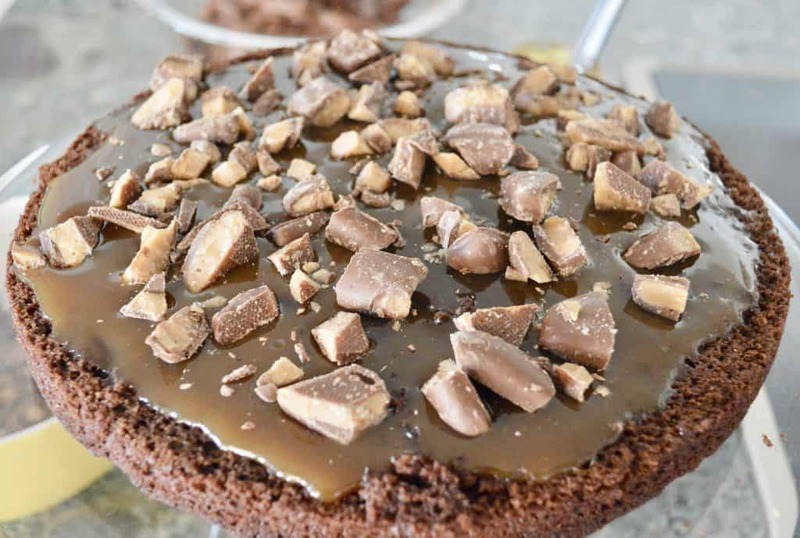 You are definitely going to want to make this Chocolate Toffee Caramel Cake for your next get together! 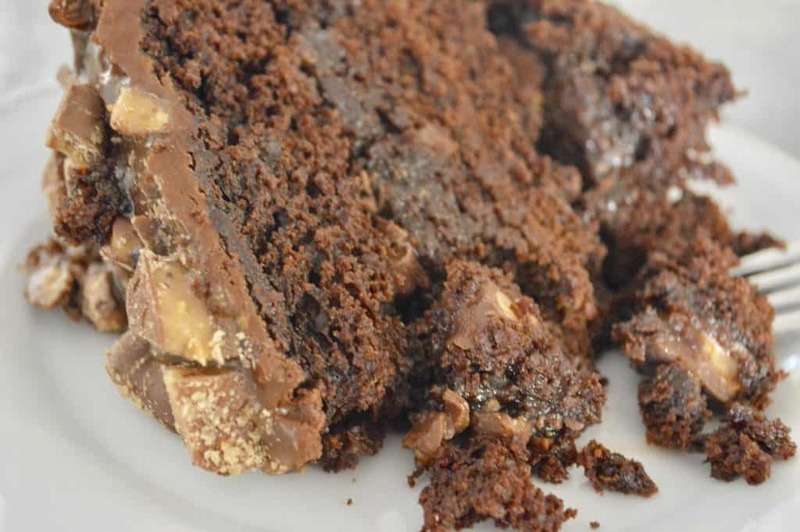 Decadent and delicious, this super moist Chocolate Toffee Caramel Cake is easy to make and such a crowd pleaser. Preheat oven to 350 degrees. Grease two 9-inch round cake pans with cooking spray and line the bottoms of the pans with parchment paper rounds. Set aside. In a medium bowl, whisk the cocoa powder and boiling water until smooth. Set aside to cool slightly. In a large bowl, add the eggs, oil, sour cream, and vanilla and beat with a hand mixer until smooth, about a minute. In a separate bowl, whisk the flour, sugar, baking powder, baking soda, and salt. Add to the wet ingredients and and gently fold in the dry ingredients. 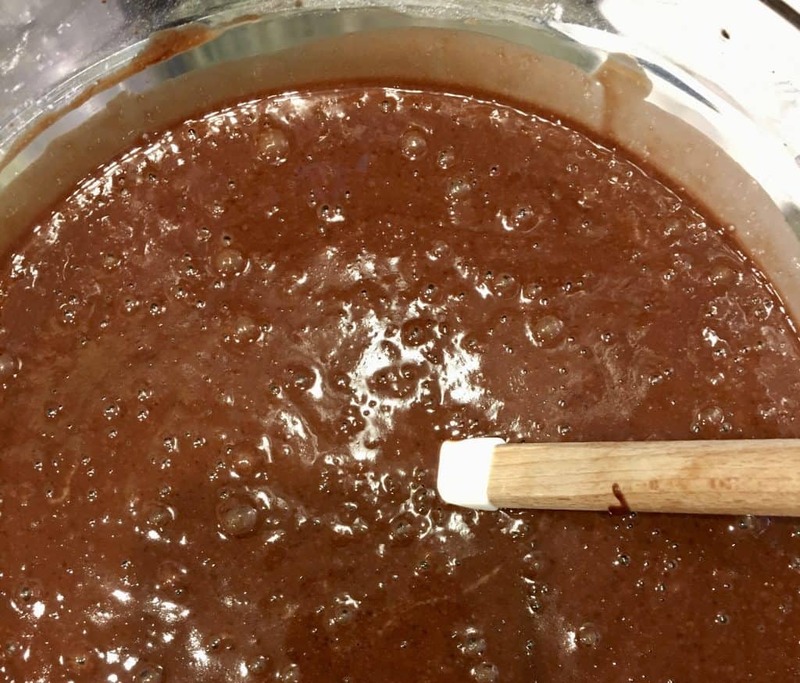 With hand mixer on low, slowly pour in the cocoa/water mixture until combined, using a rubber spatula to finish mixing together the ingredients. Divide batter between prepared pans (a kitchen scale is great to ensure equal amounts). Sprinkle in 1/3 cup of chocolate chips into each of the pans. Bake for 40-45 minutes, or until toothpick inserted in middle of cake comes out clean. Transfer to baking racks and let cool for 10 minutes before removing cakes from pan to cool completely. Once completely cooled, transfer to freezer for 10 minutes to harden slightly. Meanwhile, prepare the frosting. In a stand mixer fitted with paddle attachment, or in a large bowl with a hand mixer, cream together the cream cheese and butter until creamy, about 3 minutes. Sift in the cocoa powder and powdered sugar. Mix on low until combined, about a minute. Add in the vanilla and mix for another minute until creamy. Set aside. Remove cakes from freezer. Using a serrated knife, carefully cut each cake in half crosswise to make 4 layers. On your cake pedestal, lay down a top layer of the cake top down and press slightly to flatten. Add on 1/3rd of the caramel sauce and spread on cake layer, leaving a 1/2 inch border. Sprinkle on 1/3rd of the Heath bar. Add on another layer of cake and then spread on about 1/2 cup of frosting. Add another cake layer and spread on 1/3rd of the caramel and 1/3rd of the Heath bar. Add on the final layer of cake. Frost the entire cake spreading the frosting over the top and sides. 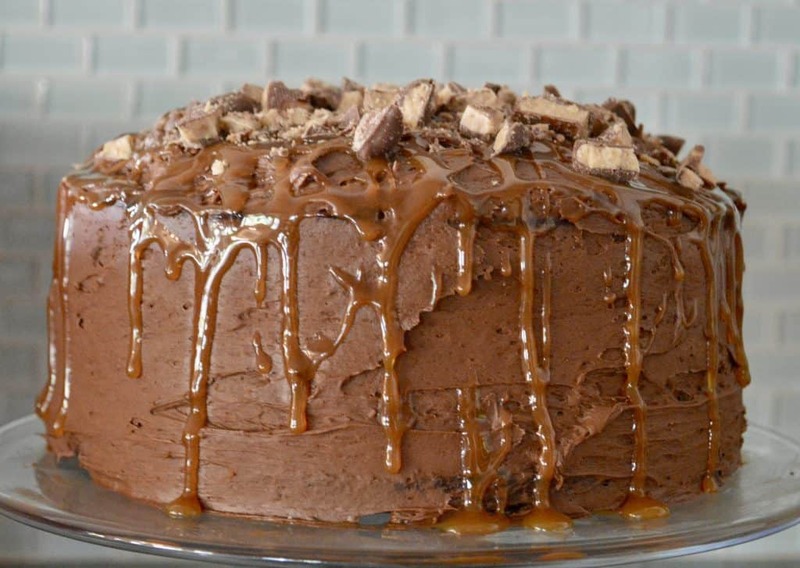 Drizzle on the remaining caramel all over cake. Sprinkle the remaining Heath bar over top. Refrigerate before serving. Lemon Ricotta Bundt Cake is a simply divine cake to serve for brunches, holidays, birthdays, you name it! 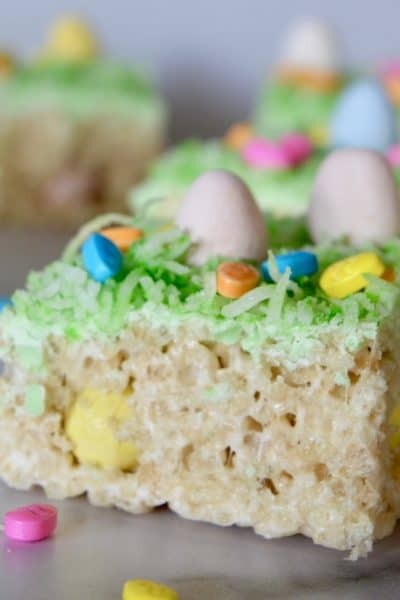 Light and fluffy, this cake is sweet enough to please the kids with all the flavors that adults love! Easy Ice Cream Cake is so simple and delicious, you’ll never buy a store-bought cake again! Customize with the flavors you love or use traditional chocolate and vanilla. 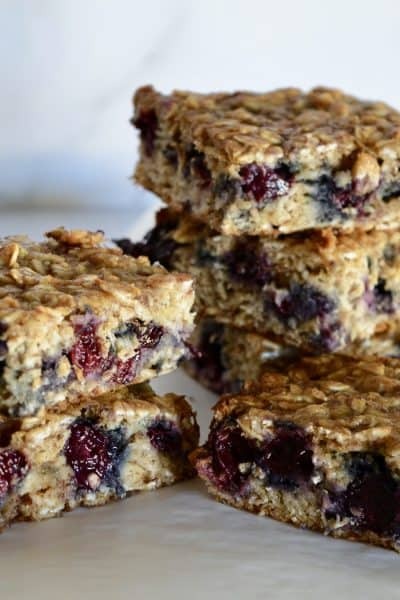 No bake and oh-so-delicious! Oreo Cake Pops are super easy and fun to make with no baking required! Customize the colors and Oreo flavors to fit your party theme.